iMediChart is a subscription service that can help the subscribers to plan, prepare and protect their future by allowing them to maintain their own medical record online. This would also help them plan logically so that they can reduce or eliminate medical mistakes in emergencies and during regular Doctor Visits. Why do we need iMediChart? All of us at one point or other need access to our personal medical info that can help us in our medical treatment. Some times it may be in emergency room and some times it could be during your routine Doctor visits. In case of Emergencies, it is paramount to have your personal medical info handy. Most of the times, the Emergency rooms have to call your loved ones to get your medical information. It is possible your loved ones may not be able to provide all the info needed to help you in your treatment. There could be very little time for them to gather that information and pass it on to the Emergency medical staff. That can lead to mistreatment or delayed treatment to you, putting your life in danger. If you can securely store all your information and update it on a regular basis and provide a means to your medical providers to access your vital information, it is possible to reduce those costly medical mistakes. eMedLogic does exactly that for you. In case of emergencies or Doctor Office visits, should the Doctors request the information on your behalf, we will be able to authenticate those requests and provide your data either over the web or via the fax. Yes. We treat your information extremely confidential. There are 2 levels of confidentiality. First, we keep all the information in a secure database with secure firewalls and encryption. Second, we have top of the line security system that facilitates sharing of your information only to emergency personnel in case you end up in an emergency or by your doctor office when requested. Therefore, no one else can access your data without your consent, even if your health card is lost or stolen. How do I sign up to iMediChart? You can sign up by accessing our website www.iMediChart.com. Go to "Register" and enter your information to register with us. Once registration is complete, you will be taken to our payment gateway with Paypal. Sign into Paypal and make your payment using your convenient methods. After the payment is done, it may take up to 24hrs for us to complete your subscription. Please check your email to for the confirmation from customer service about your subscription. Once your subscription is approved, you will be able to access the full benefits of iMediChart by entering your personal information and other medical records. Do I receive any membership card? Yes. Once you complete adding your medical records, please log in to your account and go to "Emergency Health Card Request" link on the main page to request your card. You will receive a membership card of the size of a credit card with some information about your health. Your card also has the information needed for emergency personnel or your doctor's office to access your medical record easily and securely. Apart from this card, you will also receive keychain card that can be stringed to your keys. In case of emergency, the paramedics look at your wallet or your keys to get any information that can save your life. If you lose your card, do not panic. No one will be able to access your data without your ID and password. Please contact our customer support to receive a new card free of charge. How do I update my medical records? 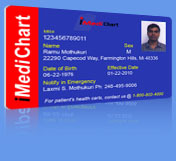 You can update your records 24x7 by accessing www.iMediChart.com. Login using your email and password and you can add or edit your personal information, emergency contacts, doctor visits etc. on the fly. We recommend that you update these records as often as you feel that it would make a difference in how doctors would assess your medical condition. This could include a minor ear infection to allergies to surgical histories. If you have any questions, you could also call our customer service at 1-800-800-4000. First login to your iMediChart account. On the main page, the date your current subscription expires is displayed. Click on the "Renew" button next to the date of expiration of your subscription and follow the instructions to go to the paypal page, make your payment and your subscription will be renewed. It may take up to 24 hrs for the renewal to take into effect on your account. How do I print all my records? After you login, go to the "Summary" page and scroll to the bottom. At the bottom of the page, click on the "Click here to Print" button. For better printing, it is recommended to use landscape mode of page setup. Will I be able to access my medical charts where there is no internet or computer access? Yes. Please call our customer support at 1-800-800-4000 and one of our friendly representatives will be able to fax your records to you. What is the cost of membership/Subscription to iMediChart? The cost of the primary membership is $30 per year. Every primary member can have up to 3 additional/secondary members on his account. In order to qualify for the $10 discount, the secondary members should key in the MR # of the primary member during registration.